With Mill and Leaf, I occasionally go out on private design projects. 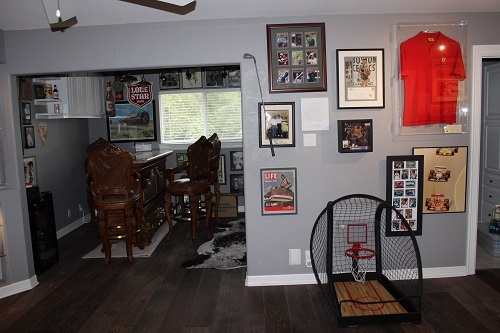 Most recently, I worked for about 2 months converting a “vanilla box” family room into a collector’s trove of sports and music memorabilia. Near completion, I quickly shot some pictures to share with our readers. 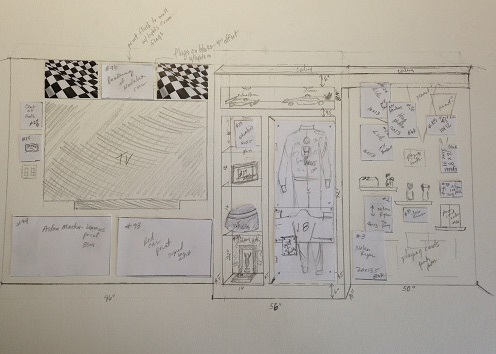 Pardon the photo quality…but enjoy the post from my designer’s perspective! 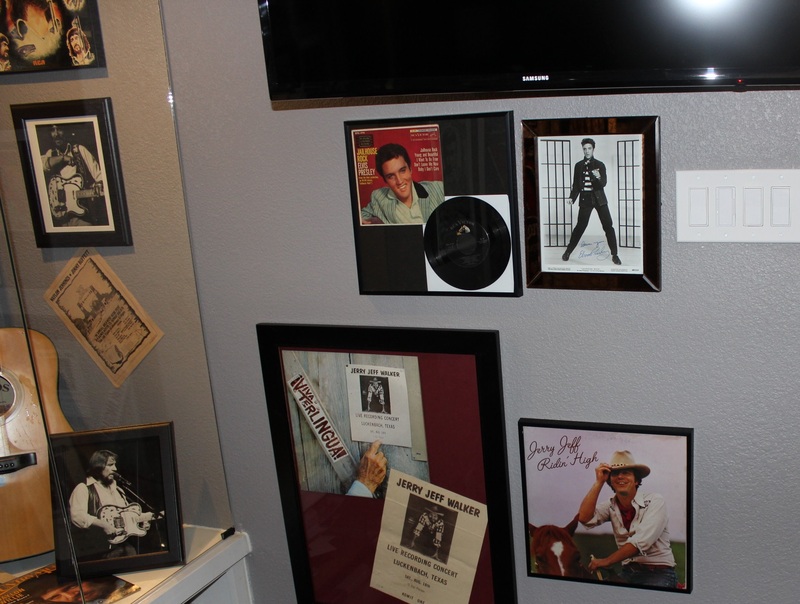 From a young age, this Austin, TX area home owner collected all types of signatures and items that seemed important at the time. From General Patton’s signature on his original Life magazine cover to Elvis and Buddy Holly, even Mickey Mantle and several other sports giants, I never knew what would show up on the list next. 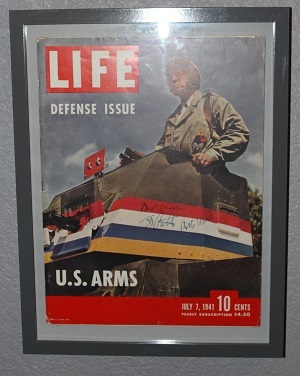 Framed Life Magazine from 1941 signed by General Patton himself! Yes there was a list. An Excel with over 200 items sorted by category and person/team with measurements and notes on each item. This list proved invaluable, initially to calculated the largest parts of the collection (in sq inches) and later to sort by frames needed to purchase, etc. After the initial list was made (of course more items showed up later) I began sketches for the final project sign off. Here are a couple of the walls I saw at first walk through. It became apparent that transforming just one room would be inadequate for the full collection. So we choose to take out the bedroom door and open up the bedroom wall into the main room to combine both spaces. 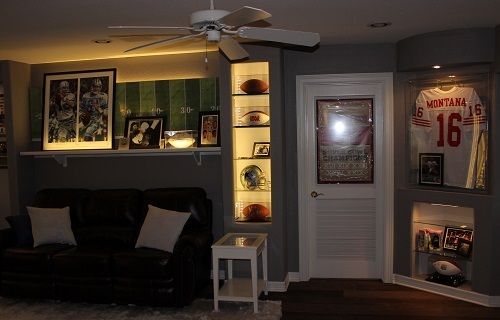 This made a unique opportunity to make the former bedroom into the music bar area and the current family room into the sports den. 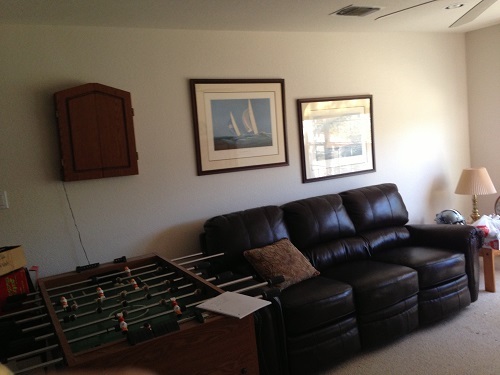 The large bar would relocate into the bedroom area, giving ample floor space in the family room. Large plank wood flooring was run throughout the two spaces to keep continuity in the design even though the subject matter changed. But I am jumping ahead… let’s back up to the original sketches. We spent a few hours photographing each item so I could envision how the items related. As an example, the homeowner had worked for Kodak as VP of Sales and Marketing for years. Sponsoring racing drivers and cars was a common event. 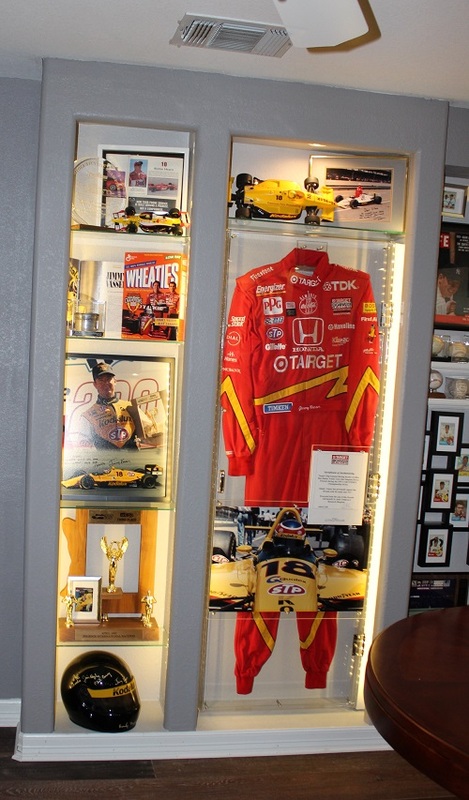 So he started collecting Jimmy Vassar items (one of the Kodalux drivers.) 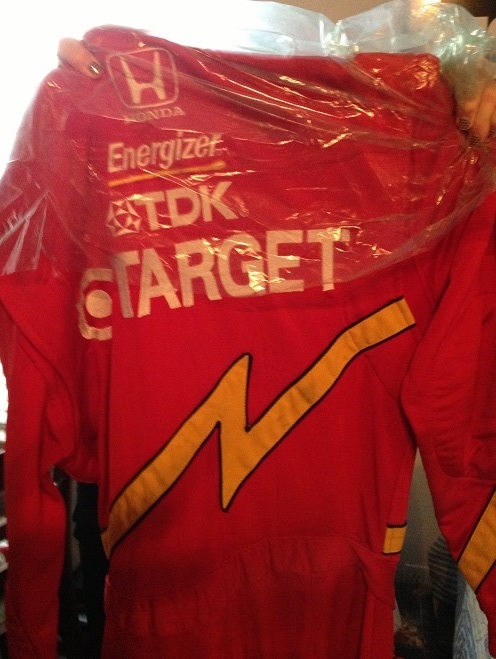 An authentic racing suit, worn in formula races, trophy replica, signed thank you photos and even a Wheaties box featuring the driver were a few of the items pulled out of storage. So the adventure of designing each area, perfect for the items to be displayed began. Specific “bump out” display shelving was designed for certain items in the collection to differentiate them from the mix. 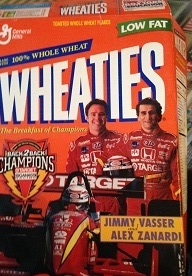 The Jimmy Vasser suit would be encased in a type of plexiglass “door” with chrome hinges and handle. This would allow the piece to be swung out into the room to see both sides of the piece. The “bump out” areas were textured like the existing walls, but painted a lighter grey than the room walls inside the shelving areas to make them visually stand out. LED lighting was run in strips along the sides of the shelving and LED gimbal recessed can lights (mini spots that tip) were placed at the tops of shelving areas and in wall boxes at the top along the ceiling where displays would mount below. 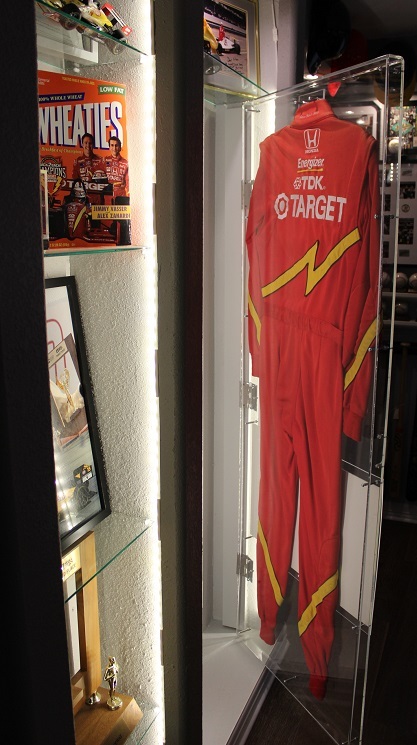 The plexiglass box with racing suit had an additional plexi layer mounting the poster of Vasser in the Kodalux car and Certificate of Authenticity concerning the suit. This kept the lower portion of the suit (no logos on the legs) from being too non-eventful, also visually balancing out the busy display on the left. 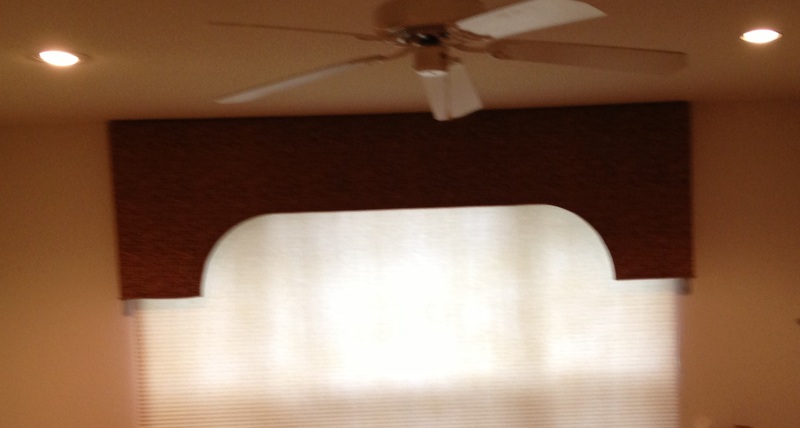 Without belaboring the process, the design continued around the room. 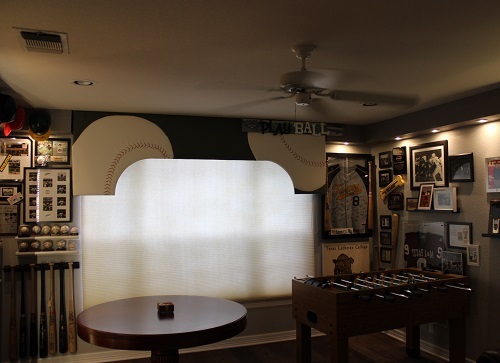 For the baseball area, I converted the large valance by recovering and attaching two huge hand stitched baseballs. 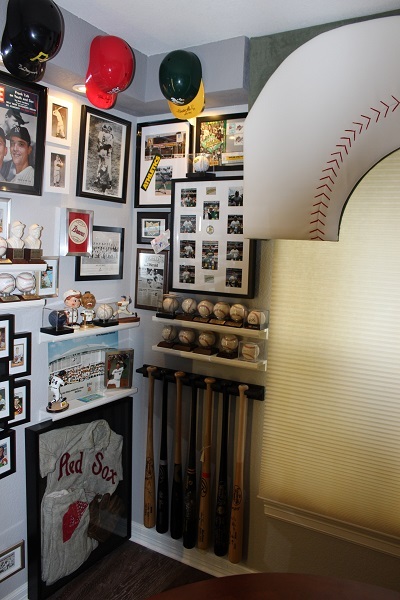 The many balls, bats cards and collectors magazines were layered by adding a block behind some pieces to hang them out 1.5 inches from the wall so they could layer over a corner of another piece that was flat on the wall. 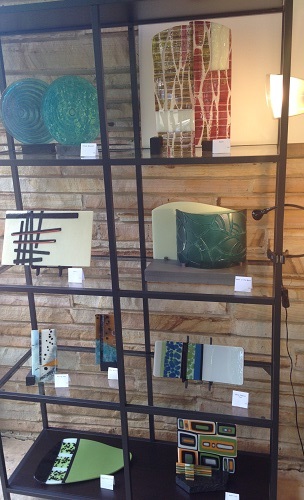 This optimized our scant wall space for such a large collection, while adding a natural design rhythm to the groupings. Baseballs attached to recovered valance. Team collections on right and left wall areas. One area of the baseball section featured older items. During the project, they discovered a vintage suit worn by a family member nearly 80 years ago was still with a sister.They managed to procure the piece and I placed it in a protective box with Grandpa’s vintage glove and hankie. This section really echoed the Hall of Fame feel. With Mantle and Maris on the Life covers and a family heirloom baseball uniform, this area became a mini Cooperstown. Football was also quite the draw, so we incorporated seats at the 50 yard line to watch the game on the TV on the opposite wall. The field graphic was a shot I had taken years ago when a company outing took my husband and I to a skybox at a Husker game in Lincoln, NE. The photo was first cleaned and skewed in Photoshop, then enlarged to 91 inches and spray mounted to masonite sheeting. Mounting plexiglass over the top made it a more professional looking graphic. Spacing it 1.5 inches off the wall, lights were run behind to give the effect of upward stadium lights at night. 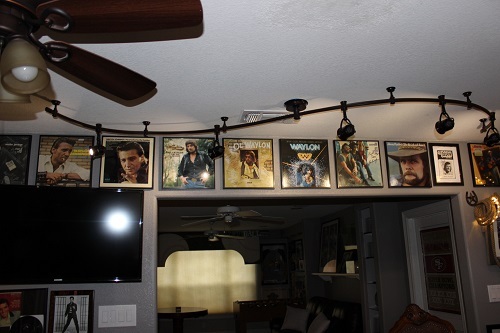 A large shelf was added below with additional lighting and a place to prop large signed items. (Cowboys and Oakland Raiders items on the same shelf…hope they behave.) With the wall nearly full, I added a corner unit to make 22″ of wall become 34 on the angle so a 30 inch plexi box with a signed Joe Montana jersey could hang. For music fans who have been patiently waiting for some tunes in this post, here we go. 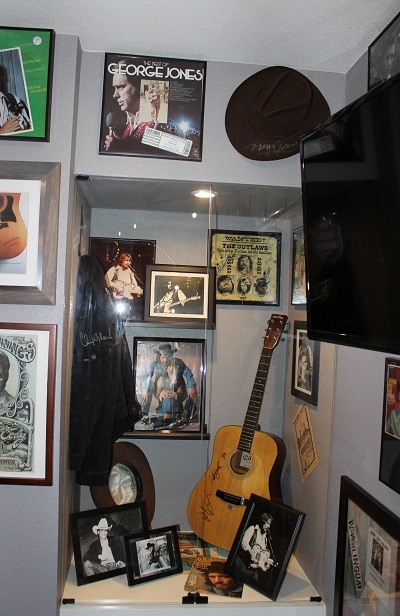 The bar area was accented with Lone Star, True Grit, Waylon and Willie as well as many other heartbroken and lonely country stars (like the three Hanks). Again signatures abound. 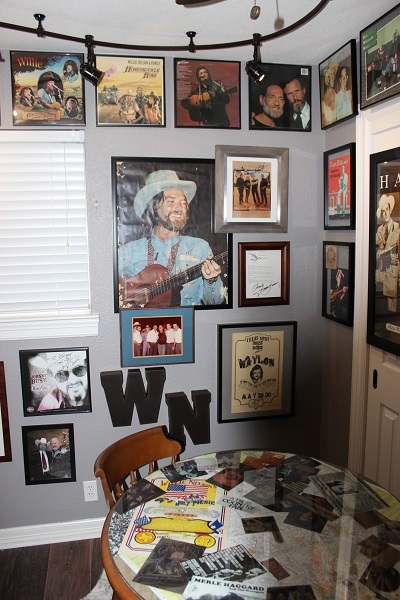 Most could be framed, but a Clint Black signed jacket and actual guitar with Waylon Jennings and Willie Nelson’s signatures needed a larger case. So we made the awkward area where the door used to enter the bedroom into a floor to ceiling display area. 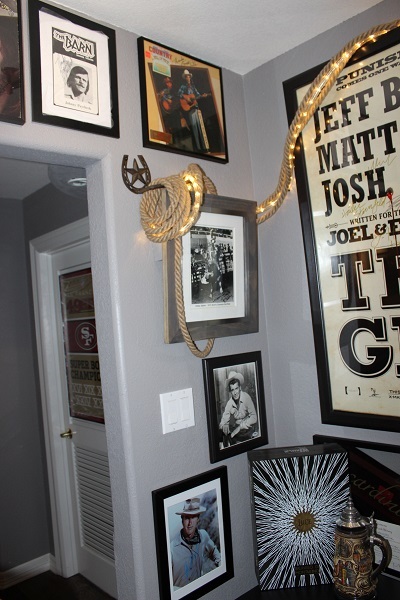 Every inch of the room was hung with record covers lining the ceiling border. No respectable bar in the Austin area would miss a collage of the renowned WN. 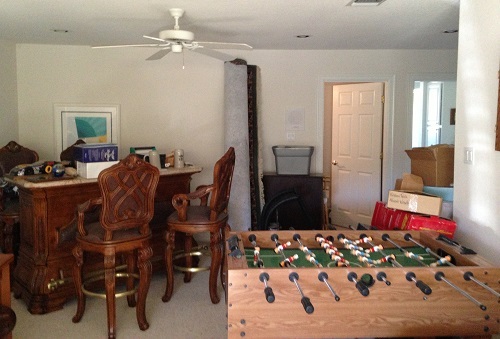 The table in the foreground was the owners childhood game table. 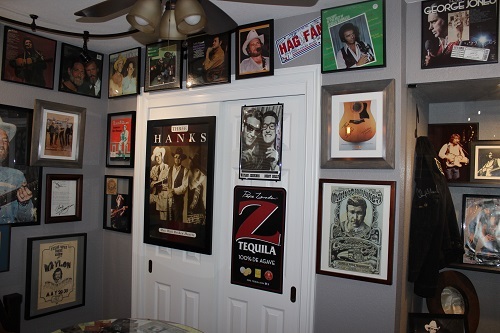 A collage of old music clippings, Texas map and concert posters under glass hide the original top. Next to Willie are the “Three Hanks.” Even the sliding doors were decked out with thin pieces on the right so the closet is still functional. 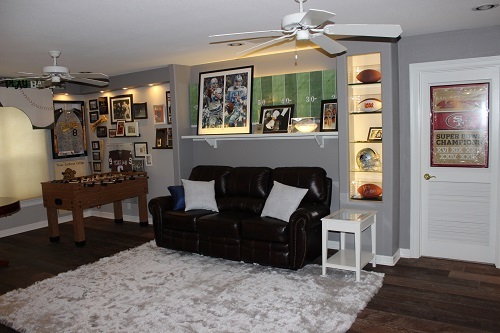 The homeowners tell me they have a great time relaxing in their newly displayed memory rooms. They might be able to charge a cover to offset the design fees! I would… (just kidding). 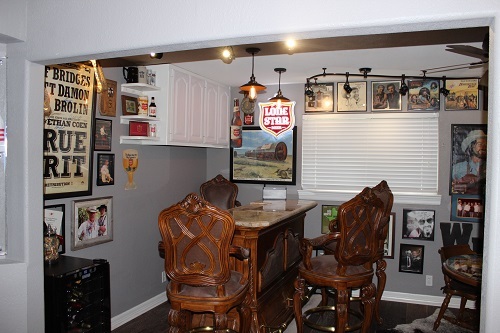 But overall what a fun project for me and a great space for their entertaining hours. 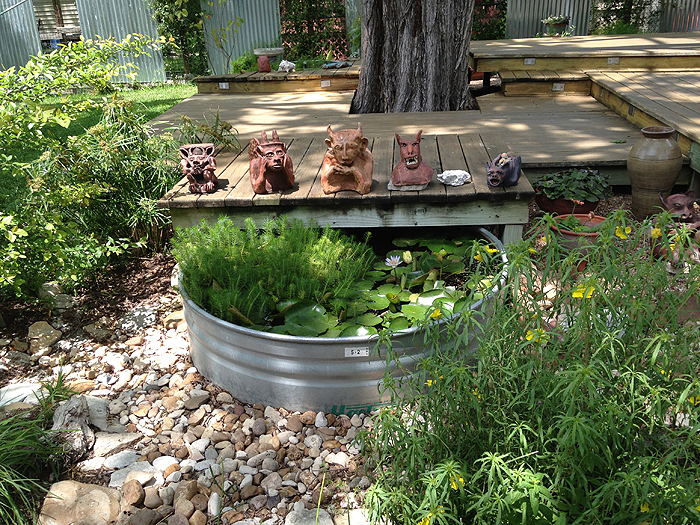 For the WEST Studio Tour, only the Austin area west of I-35 and east of Hwy 360 is considered a viable stop. For the Spring 2014 tour, that equated to 241 stops! I have to target a few favorites for this blog, but this is just the tip of the iceberg…make it a point to attend the next WEST show! 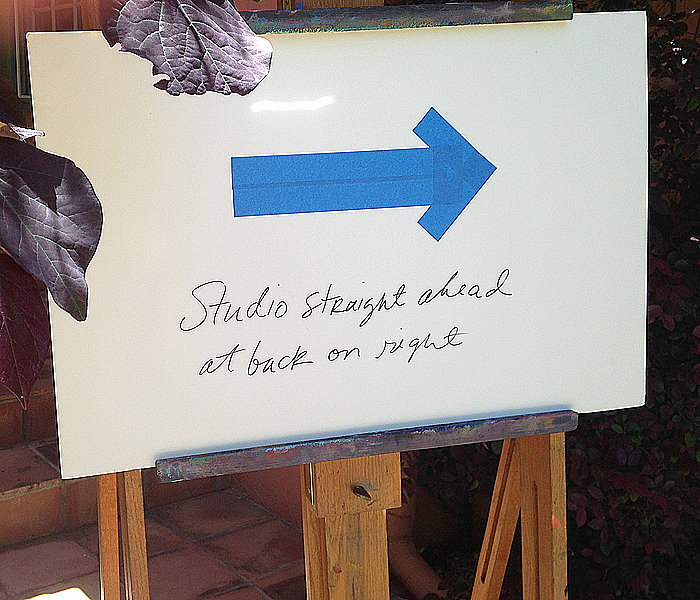 One of the popular stops is along 2309 Thorton Rd, where several studios nest together. Fireseed Clay, home to several working potters, always comes through with new and different faces. New faces on the tour there included Jennifer Hill and Texadae. 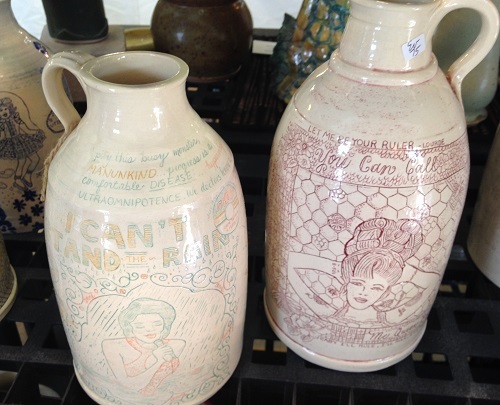 The Nice Jugs pieces can be ordered to commemorate an event or person in your life. Texadae@gmail.com to order. How fun! 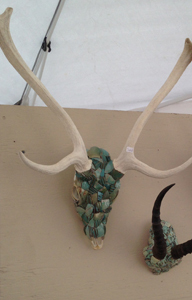 Still in the Thorton Rd studio area, we saw metal, photography, painting, jewelry and wood. A feast for the fine craft connoisseur. One of our stops included a Ridgeview street home with multiple artists. 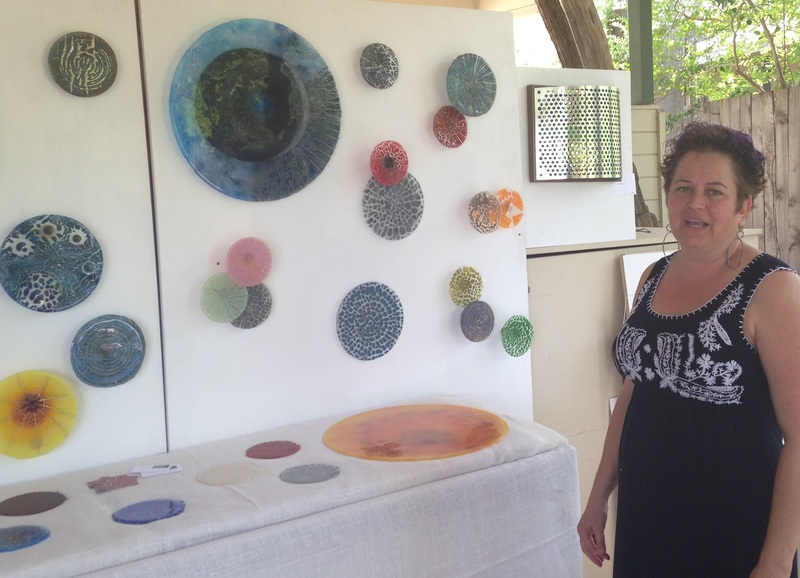 Talented glass artist Andrea Loomis explained how her pieces can be ordered in custom groupings. 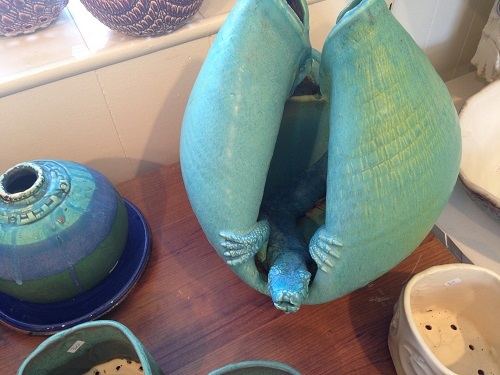 In a modern home, this would make quite a presentation along a staircase wall or feature area. Andreas platters could even mount on a ceiling for an incredible effect! 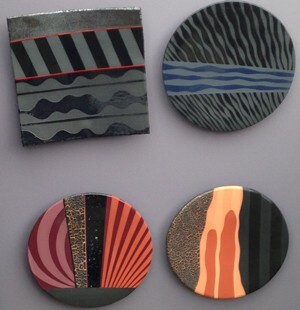 Malina Cipleu works in both fused glass and polymer clays. spot on and craftsmanship superb. 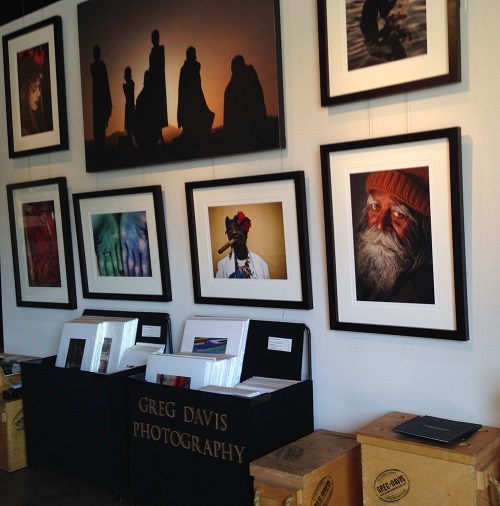 One of Austin’s elite historical areas, Hyde Park, also featured several artists. 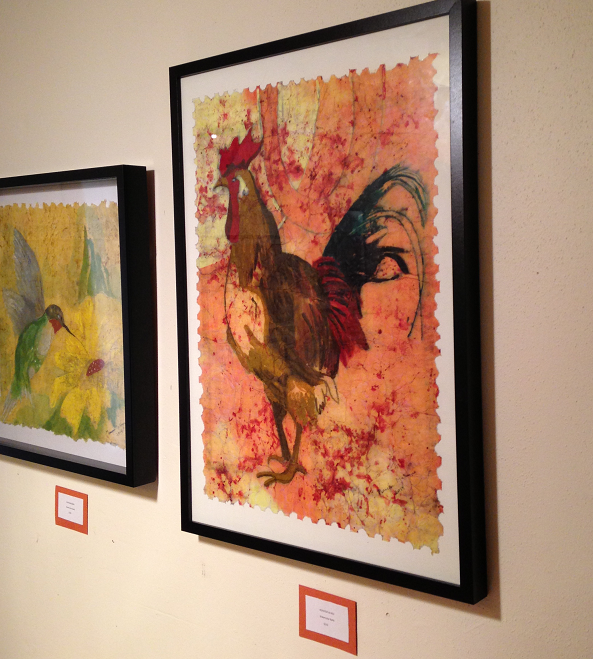 Denise Fulton opened her home on Avenue H in Hyde Park, showing her own paintings and digital art by Chalda Maloff. Incidentally, Denise’s husband served incredible homemade cheesecake in the kitchen! 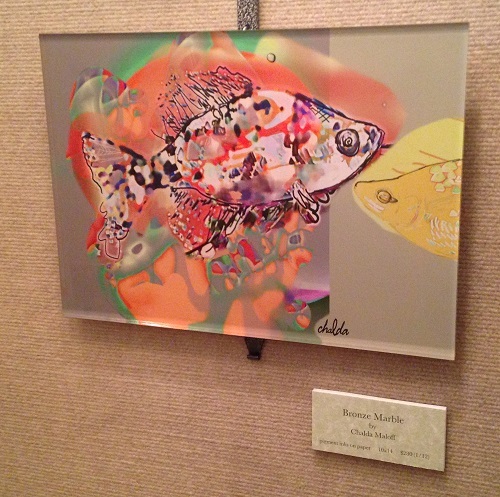 Chalda Maloff explained the time consuming process of her digital art. Printed on the back of glass, these incredible fish pieces truly came to life. Every artist needs patrons to keep the work flowing out of their studio. Any time you get a chance, support your local creative community. Life truly thrives with art inspiring us all. Seattle has a water world all its own, brimming with ocean life and numerous shipping and sailing vessels. Look a bit closer though, and you will find a lifestyle choice of island living accessible by ferry rides through Puget Sound. Vashon Island, WA is strictly dependent on ferry transportation as NO roads or bridges connect this beautiful land mass to civilization. With just over 10,000 residents in roughly 37 sq miles of area, it is not densely populated with anything but trees! 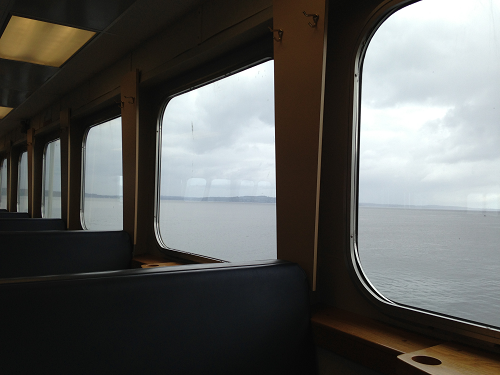 Each spring and fall, art seekers hop on the ferry to get a glimpse of the beautiful scenery, local culture and great food during the Vashon Island Art Studio Tour. Once off the boat, you enter the true NW Pacific life. Driving off the ferry, armed with my cell phone listing the initial studio address, this year’s May 2014 discovery began. We quickly learned each artist’s studio stop had descriptive brochures with a handy map of the full tour. 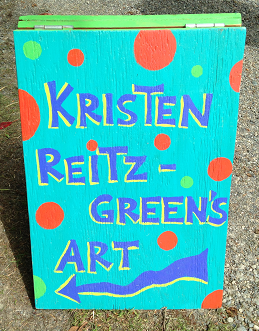 Toward the north end of the island, we visited painter Kristen Reitz-Green’s studio. 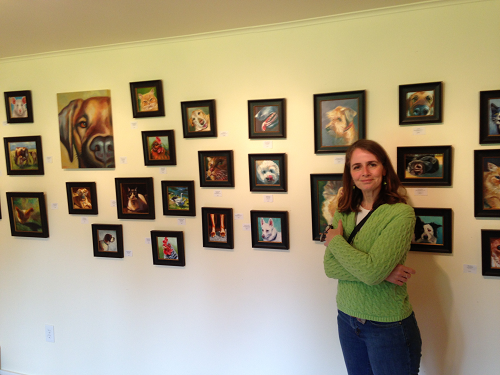 Quaintly situated in a the Green barn behind her home, we were delighted with her incredible pet portraits and all her original oil paintings. Kristen explained her life long love of the arts which included a long professional career as a symphony french horn player. Eventually she stepped out of the lime light and into great painting light to truly hone a new craft. 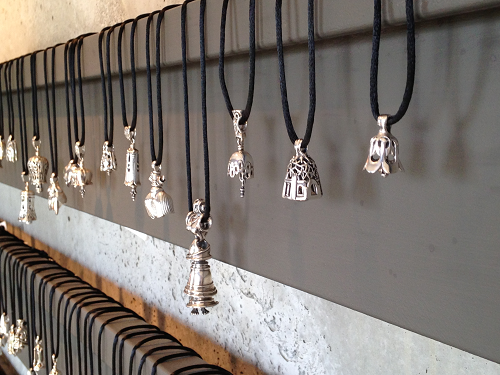 Kristen pointed out a few studios we would not want to miss, so we headed to the nearby shoreline studio of GRB Bells. 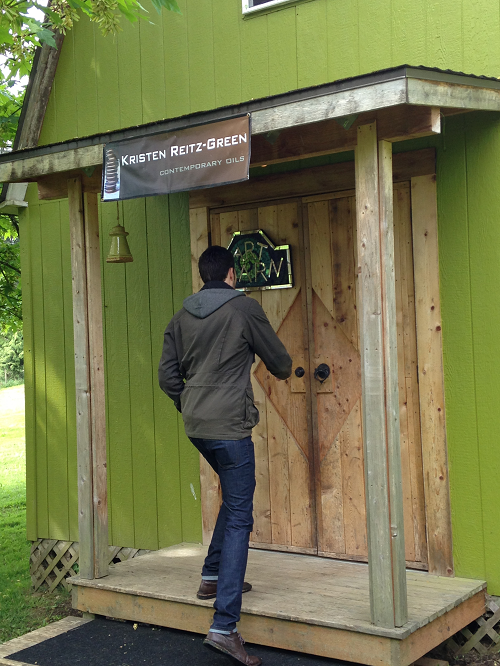 As a true nature lover, the entrance to this functional jewelry studio was half the fun! What a view of the Sound! Gordon Barnett, after receiving a BFA in painting in the late 60’s, learned jewelry making had a bit more income potential. After a decade of casting, he tried his first bell. So many thankful patrons are glad he did! Sterling silver bells hand made by Gordon Barnett, each one with a unique ring. Back in the car, we headed once more through the tree lined roads, stopping at the Hardware Store Restaurant for some incredible clam chowder and fish tacos. YUM! Ready to take on more sights, we headed far down the island to The Marjesira Inn. Originally opened in 1904, you can still envision the docking of a steamship at the wharf unloading the original guests. 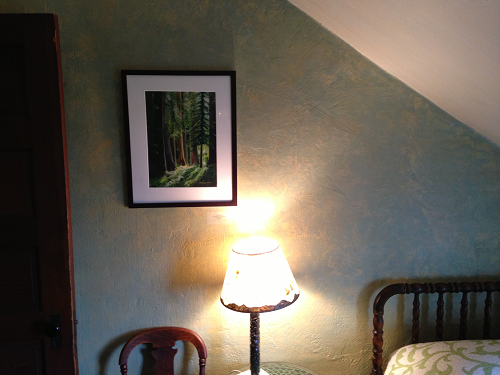 Still working as a two room available B&B, owner/occupant Jacqui Lown treated us to a large sample of her paintings and prints in the drawing room, and upstairs in the historically rich inn. 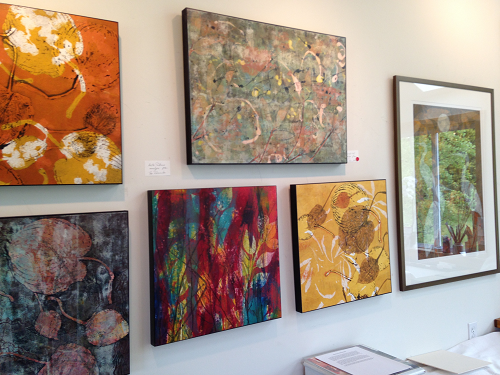 If contemporary art combined with the rugged NW scenery is appealing to you, check out the work of Gunter Reimnitz. We ventured up the walk seeing Gunter’s huge pieces in the yard of the three artist Reimnitz Studio which also featured Hartmut and Ilse Reimnitz (Gunter’s parents.) We joked with Gunter that he probably did not stand a chance at another career with two artists as parents. 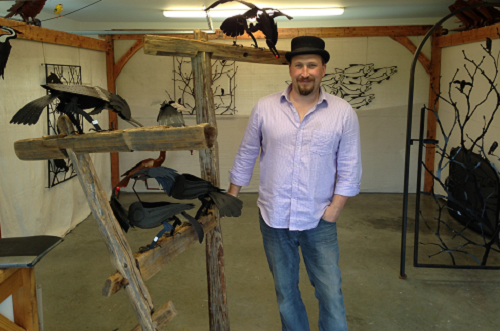 But his work is so fresh and fun, you can see he keenly loves his career. 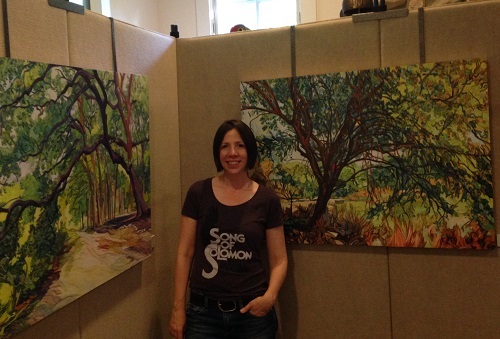 Ilse Reimnitz was also on hand with stunning contemporary monotype prints as well as her watercolors and art cards. Hartmut Reimnitz is an incredibly talented oil artist as well, with several pieces displayed. If you ever get a chance to see this families pieces in person, don’t miss it! 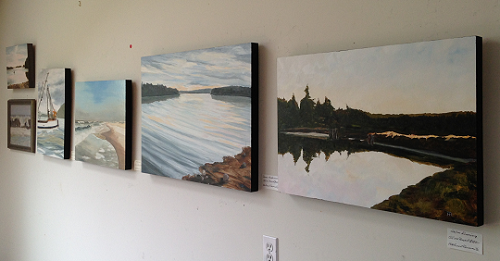 Before getting back on the ferry, we stopped in a group show in the Grange Hall on the top of the island. 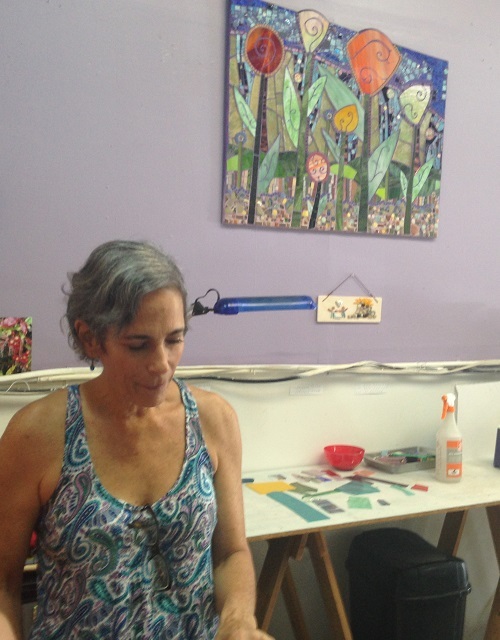 One memorable artist, Marcia McKenzie, is known for her batik technique on rice paper. Quite the nice lady as well as a creative talent! 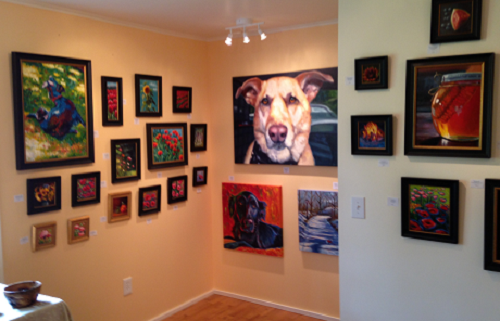 Between the fresh air, back road navigating and good food, what the Vashon Island Art Studio Tour lacked in number of artists, (just 23 stops,) it more than made up for in original content and atmosphere. Thanks to our Seattle native (and my son) Nate Otto for keeping a hand on the wheel while I soaked up the scenery! If you happen to ferry out to Vashon when the tour is not in progress, stop in The Heron’s Nest in the center of the island on Vashon Hwy. It is loaded with the work of over 100 artists from the island with 60% of the proceeds going directly to the artists and 40% benefiting the local arts. 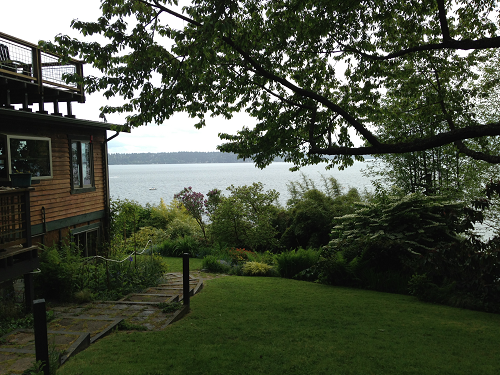 In such a picturesque setting, we hope to see the Vashon arts community thrive! 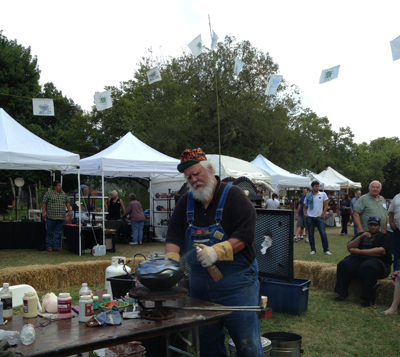 In the fast paced cyber world that has reached all of us in some form or another, a day of escape to Gruene, TX for the Texas Clay Festival was just what the doctor ordered! 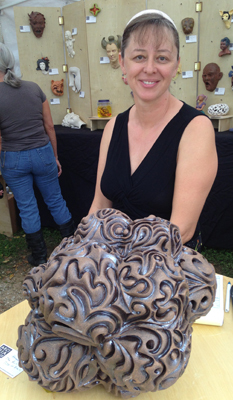 The artists, all talented clay workers, showcased the best Texas has to offer in this medium. In addition to their well priced booth products, many gave live demonstrations in several venues throughout the day. Randy Brodnax finishing a piece with ferric chloride spray after live firing. 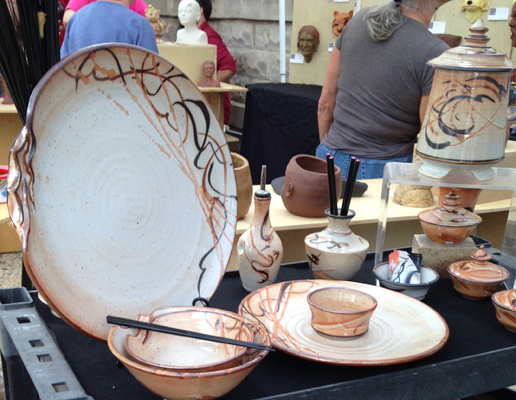 Randy Brodnax collected quite a crowd as he pulled hot pieces from his onsite gas fired kiln. 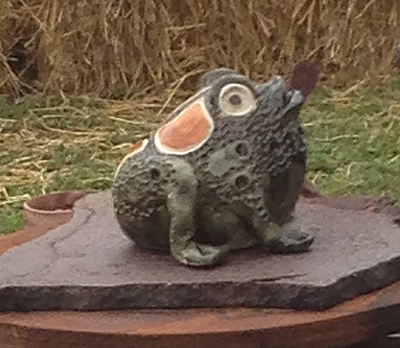 Pieces were selling “hot off the press,” with one especially “hot” item – three legged frogs. This lucky frog made it through the firing into a trash can with newspaper reduction process. Creative dinnerware was an easy find. Kym Owens, Vietnam orphan, adopted as a baby, grew up in Lubbuck, TX. 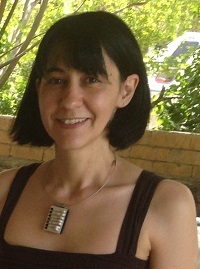 Also a classically trained dancer, she can be found teaching at Sunset Canyon Pottery in Austin. Prepared to be inspired! 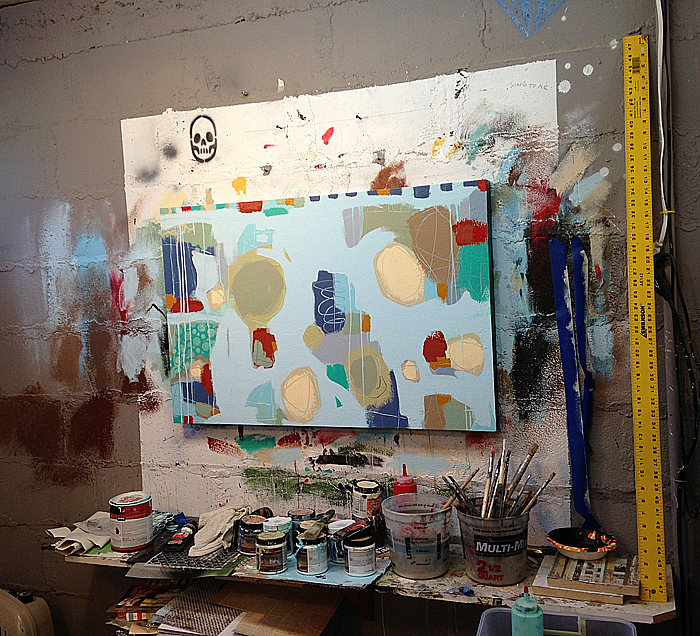 Artist studio tours throughout the U.S., you can help get caught up with artistic inspiration. Even if you are not an artist yourself, or shopping for quality art work, the unique homes and studio spaces may inspire you to pick up a remodeling hammer in your own space. The creative use of an L-shaped lot, with only a small amount of street contact in Austin, TX, worked well for a studio/home combo for Diana Seidel. The small home near the street was converted into a quaint potter’s studio. The larger open back of the lot was used to build a new home. 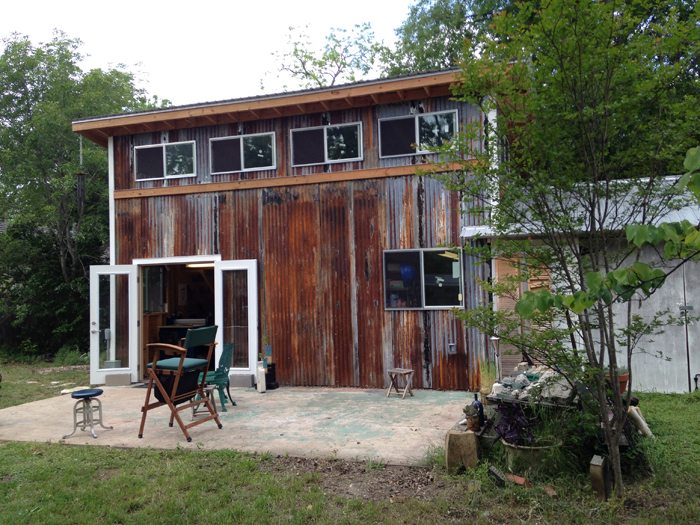 Diana Seidel’s customized studio in front of her Austin home. 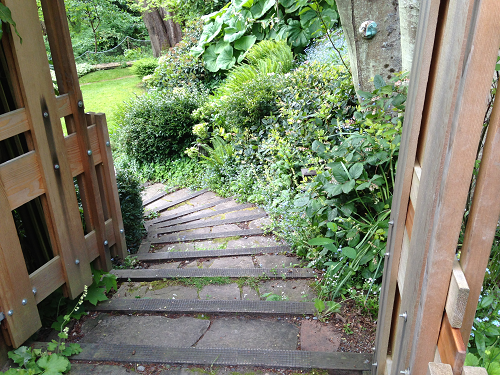 Entrance to Melissa Grimes home/studio was inspiring. The inside space allowed for three secluded porches that wrapped around the home for a welcoming entrance, a well lit studio and private eat-in porch. 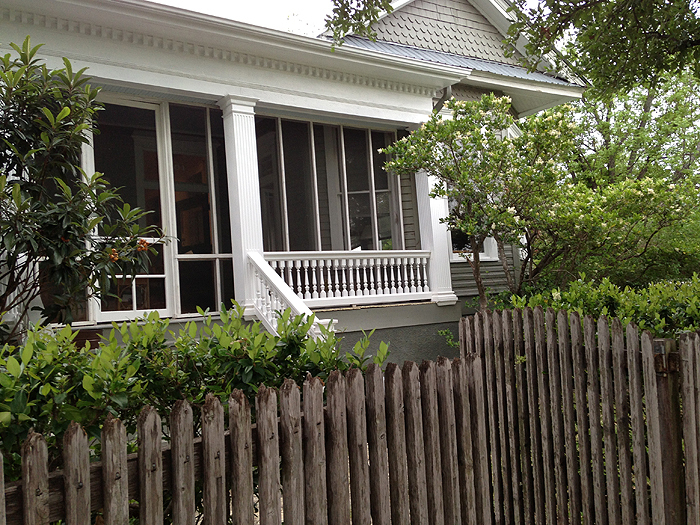 Grimes noted the turn of the century home was “pulled” into the Austin neighborhood. Detailed preservation but also some added interior features make the structure comfortable and workable. Many artists use their creative energy both inside and outside their properties. 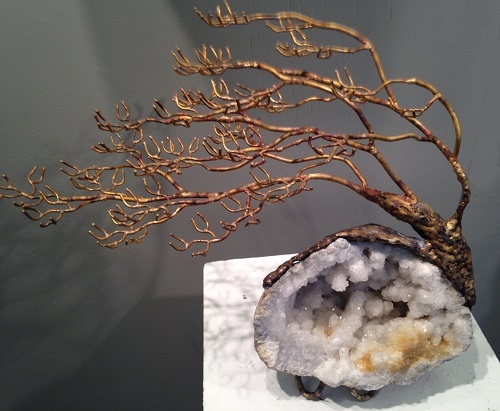 Stephanie Bradley, artist/realtor saw a diamond in the rough in her central Austin home. 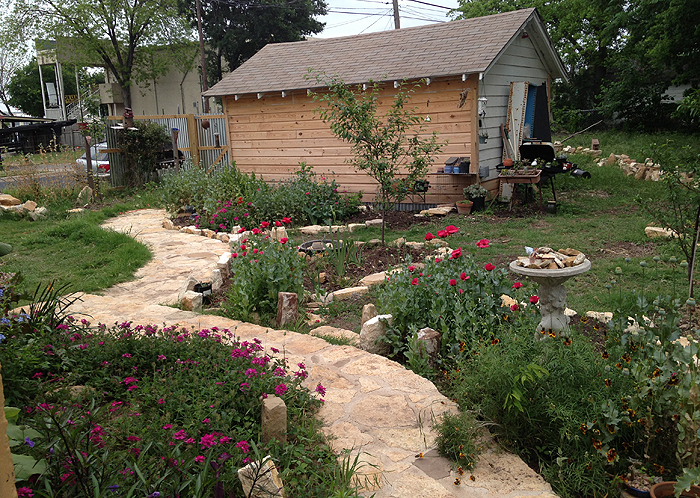 The rough, disheveled yard was converted into a storybook walk to additional studio space in the garage. 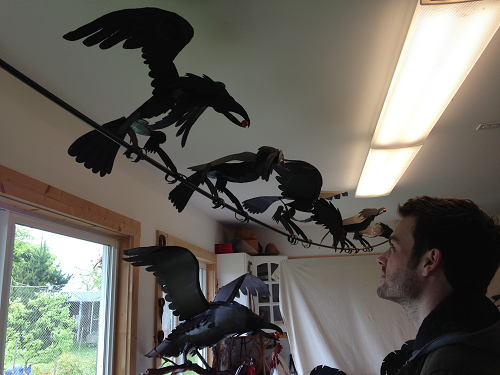 For many of the artists on the tour, we were allowed a rare glimpse of work in progress. 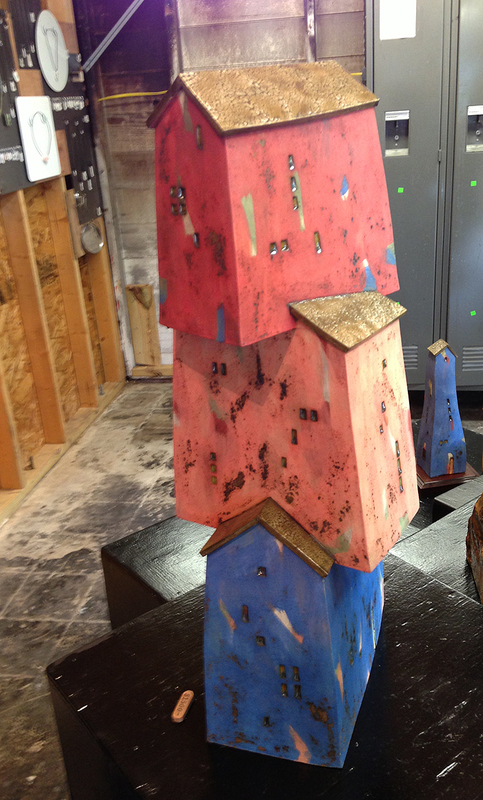 Across the alley from the Austin Art Garage, we were allowed into the inner sanctum of Austin artist Joel Ganucheau. Not every painter has an easel! 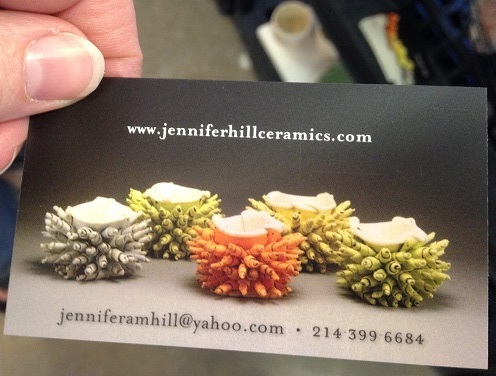 So get online and do a Google search for “art studio tours” followed by the name of your city. The drive and inspiration is incredible, as well as meeting the artists in person. Understanding their perspective may change your perspective entirely on what to purchase for your space. Or you might be inspired to get your own studio started! 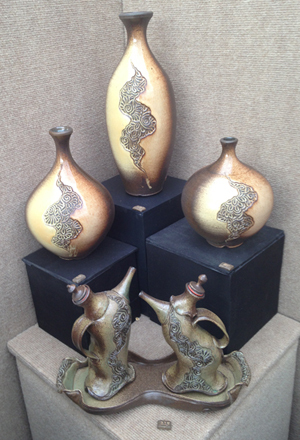 Over a year ago, Todd Van Duren’s pottery workshop, behind his home, literally went up in flames. But many of his fellow potter’s in the Austin, TX area came to his aid the next few days to sort through the ashes. Not only were many finished pieces saved, but the artist says the glazes took on incredible colors and patinas resulting from the high temperature “firing.” 80% of the salvaged pots sold fairly quickly to discerning collectors that realized this one-time opportunity. As the sort/salvage on the burnt out structure progressed, the roof tin from the old studio was kept and later used to work as siding when rebuilding began. 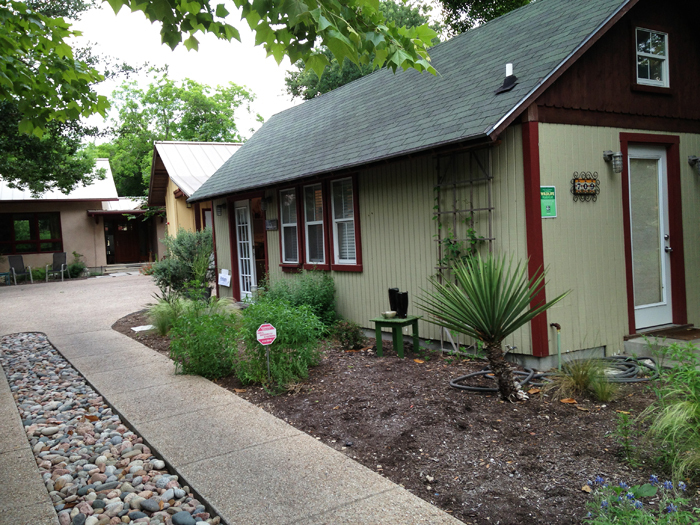 During the recent WEST Studio Tour in Austin (April and May 2013) we saw the new workspace. The interior was still waiting on wall board, but the exterior proudly shows off the burned tin as a tribute to the assistance of his fellow artists. 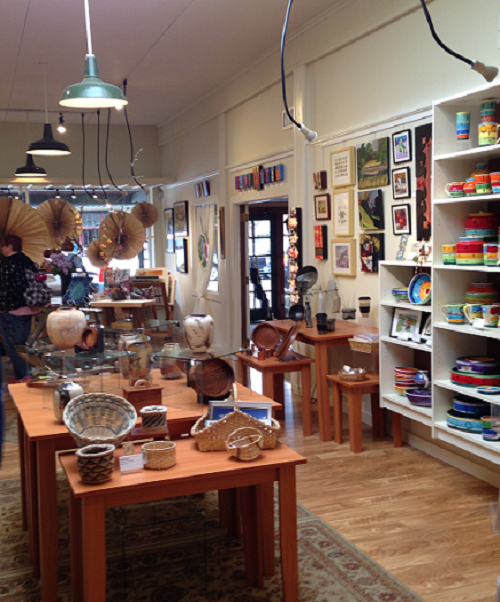 New Todd Van Duren clay studio with tin reclaimed from earlier fire. Van Duren continues to work on his “housing projects,” slab built structures made entirely of clay. The new studio has lots of light and entirely new wiring. Note to ANY artist considering a garage remodel into an art studio: Check your wiring thoroughly. The in wall wiring Todd had not replaced in his space caused the studio destroying fire. And don’t forget to insure any structure that is part of your creative business! Artist’s minds don’t stop being creative just because they are out of their studios. 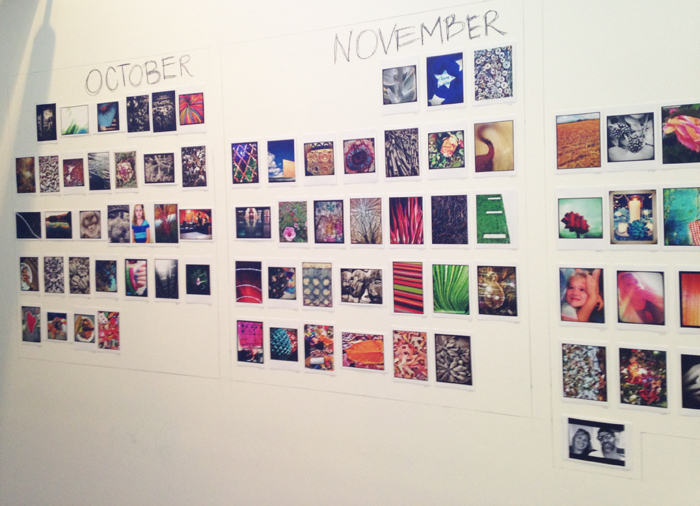 The artistic eye of Sarah Bork in Austin, TX is always on the look out for her “daily image.” Bork made a commitment to do a full year of iPhone photos with a daily piece placed on “calendars” drawn on her home walls. In addition to using the iPhone to take all the photography, she found editing apps that allowed her to manage any contrast and brightness issues she could detect on the spot. 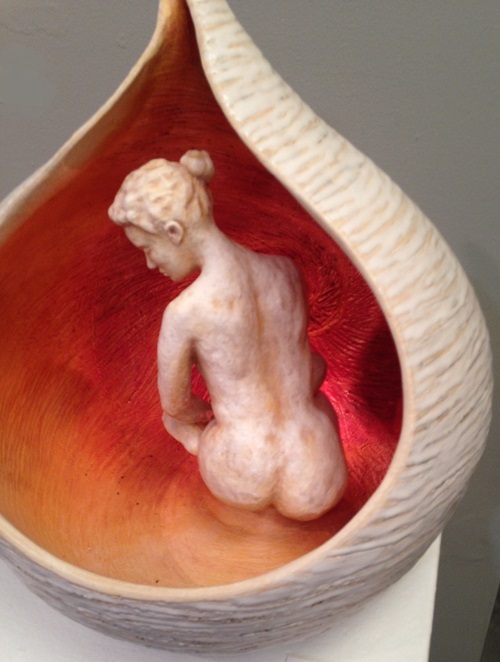 The nearly completed year was on display in her home during the West Studio Tour held in Austin (April and May 2013). Kudos to Sarah for sticking to the daily plan, but also showing her amazing photographic eye in such an accessible method.